"Launch" redirects here. For the Ultimate tournament, see Tournament:Launch. As the damage meter goes up, so does the knockback of most moves, as seen here with Mario's forward smash on Link. Knockback is the measure of how far an attack sends its target. For most attacks, knockback increases as damage on a character increases. An example of an attack with high knockback is Bowser's forward smash; it launches opponents very far, so far that at high damages it's more powerful than a Home-Run Bat's smash attack. Pikachu's neutral attack, on the other hand, has very low knockback - it hardly sends opponents anywhere, even at ludicrous damages. Attacks with relatively low knockback tend to be good for combos. The knockback of almost every attack works in tandem with the target's damage - it increases as the target's damage gets higher. It is also affected by the target's weight, gravity, and a few other conditions (such as type effectiveness). While not the primary factor, the damage dealt by an attack is a significant factor in how much knockback it deals - this is the reason stale moves have less knockback than fresh ones, and the reason smash attacks deal significantly more knockback when fully charged. Each hitbox of a move has two knockback values: a base knockback and a knockback scaling (also known as knockback growth). Base knockback is the minimum amount of knockback the attack can deliver under normal circumstances, and knockback scaling is a factor that controls how much the knockback increases as damage increases. Moves with high base knockback can deal high knockback (such as performing a forward smash with the Home-Run Bat), even against fighters who haven't taken much damage, and tend to be more effective at KOing when fighters can easily be sent flying at low damage percentages (such as against lighter fighters, when near the edge of the stage, or when a fighter is handicapped to sustain more knockback). Tiny-sized fighters are usually the most vulnerable to getting KO'd by high base knockback attacks, due to having reduced weight, and an increased knockback taken multiplier. On the other hand, moves with high knockback scaling can reach KO potential more quickly (such as Luigi's forward smash), especially if they have a high damage output, and tend to be more effective at KOing when fighters need to take greater knockback than what a high base knockback attack can deliver on its own (such as against heavier fighters, when far away from a stage's blast line, or when a fighter is handicapped to sustain less knockback). Advanced techniques to extend survival, such as DI and momentum canceling, are also less effective the stronger a move's knockback scaling is. In Melee, the highest knockback delivered and received by each character is given in a match's results screen, labeled as "Fastest Pitch" and "Top Speed" respectively, though the numbers lack meaning. In Brawl, the velocity applied (in units per 1000 frames) is provided instead of the knockback value (though it's simply knockback divided by 0.03). The unit is given as "mph"; while this would presumably mean "miles per hour", this is obviously not the case, as a 1,000 mph hit would barely send characters anywhere. In Super Smash Bros. for Nintendo 3DS, knockback units are again shown without a meaning, while in Super Smash Bros. for Wii U, they are measured in "mph" as in Brawl, though in a lower scale. Strangely enough, knockback for a same move between the two games is actually shown in different scales: Ganondorf's Warlock Punch, for instance, scores 102 units of knockback against Mario at 0% damage (without other modifiers) in Smash 3DS, while scoring 53 mph under the same conditions in Smash U. Despite these differences among games, they all internally use the same knockback measurement units in accordance to the knockback formula, as evidenced by moves with unchanged damage and knockback values throughout them (such as Jigglypuff's back throw from Melee to Smash 4) keeping their knockback identical. 172.5 5750 The approximate knockback needed to KO from the center of Final Destination with the Sakurai angle DI'd down. 186 6200 The approximate knockback needed to KO from the center of Final Destination with the Sakurai angle and no DI. 204.75 6825 The approximate knockback needed to KO from the center of Final Destination with the Sakurai angle DI'd away. To determine how far a character is launched away, the numerical amount of knockback caused is multiplied by 0.03 to calculate launch speed, and the initial value then decays by 0.051 every frame, so that the character eventually loses all momentum from the knockback. During this time, character-specific attributes such as air friction are disabled; however, falling speed still takes effect when the character is close to stopping, giving fast fallers slightly better endurance against vertical knockback than others of their weight. In Super Smash Bros. Ultimate, when knockback is high enough to cause tumbling, it possesses a new effect that increases the usual launch speed and decay by an amount proportional to the knockback inflicted. As a result, when characters take particularly high knockback (such as enough amounts for them to get KO'd), they are launched away very quickly, then come to a stop almost immediately, effectively causing the launch to execute much faster. Hitstun is also affected by this change, becoming shorter at higher damage percentages compared to previous games. According to director Masahiro Sakurai, this effect was implemented to increase the overall speed of the game, by reducing the time during which launched characters are incapacitated. The visual and mechanical differences this effect causes on knockback are notorious enough that it is often dubbed "balloon knockback" by the community, as it has similar physics to hitting a balloon in real life. Moves with fixed knockback retain traditional knockback physics. Appearing in all games to date, visual effects known as angle indicators show when a hitbox collides with an opponent; as its name suggests, the angle indicator shows the angle of said hitboxes. In Brawl, angle indicators show different colors depending on who or what they hit. For player one, the angle indicator is red, with the second player's indicator being blue, and so forth. Computer-controlled opponents and objects like Sandbag have white angle indicators. Angle indicators appear in Super Smash Bros. as small "bubbles" appearing in the direction of the angle. In Smash 4, angle indicators appear as colorful, stylized "debris" flying off of an impact. Smoke trails also indicate the angle at which a character is knocked away, but only appear when a character has taken a lot of damage, and are thus much less useful. 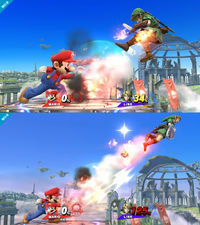 In Smash 4, said smoke trails at higher knockback values are accompanied by thick light trails, colored depending on the player that dealt the knockback. Note the downward facing lines that indicate Donkey Kong's meteor smash. The angle indicator in Super Smash Bros.
An angle indicator in Smash 4. A demonstration of the effect of gravity on knockback, the Shulk on the left uses the hyper Speed Monado Art, increasing his gravity, and as a result, the knockback he sustains. The result of this formula increases vertical launch speed if the target enters tumble. As a result, characters with higher gravity get launched faster than those with lower gravity, depending on how vertical the angle is, resulting in fighters with higher gravity stats having worsened vertical survivability. In Ultimate, the formula is no longer applied to angles between 70 and 110. This mechanic is seemingly an attempt to normalize the effect of combos and multi-hit moves on characters of differing gravity. This formula is also applied to moves that launch opponents downwards, though since vertical launch speed is negative in this case, the result of the formula effectively decreases it slightly instead, reducing the effectiveness of meteor smashes on fast fallers. p is the percentage of the target, counted after the attack's damage is added. d is the damage the attack dealt. In SSB and Melee, it is the full damage without counting stale-move negation, except for projectiles, which use the stale damage. In Brawl, it is the damage including the staleness or the freshness bonus. In Smash 4, it is the damage including 0.7x of the staleness or freshness bonus. w is the weight of the target. It is set to 100 if the attack is weight independent. Note that in SSB, heavier characters have a lower weight value than lighter ones, in accordance with the formula. s is the attack's knockback scaling (also known as knockback growth) divided by 100 (so a scaling of 110 is input as 1.1). b is the attack's base knockback. The total amount of knockback dealt can also be subtracted by the target's knockback resistance, which is applied after all the other calculations have been made. However, hitboxes that have the bury effect can ignore the knockback resistance. If the move has a fixed knockback value set, then d is set to that value, and p is always 10. As a result, the knockback dealt is independent of current damage, damage dealt, and ignores stale-move negation's knockback modifiers. However, it still remains dependent on other factors. The vibrant "Deadly Blow" effect will appear if an attack does enough knockback to KO the victim. Bouncing off a surface reduces knockback by 20% in Melee and Smash 4 and 15% in Brawl. Landing a meteor smash or spike on a grounded opponent counts as a bounce, if enough knockback was dealt. Because the bounce occurs after the hit, the amount of hitstun suffered is not reduced a corresponding amount, meaning that downwards-hitting attacks tend to be excellent combo starters. In Brawl, characters that take enough knockback to be sent tumbling will slightly damage opponents they run into while flying. This hitbox belongs to the character that dealt the knockback, and inflicts minor damage (usually from 1% to 4%) and knockback depending on how powerfully the character was launched. This is also present in Melee, but only applies to characters who receive knockback after a throw (not counting special move grabs like Falcon/Dark Dive and Koopa Klaw). This property was later removed in Smash 4, where launched opponents simply fly through other characters like in previous games. A similar effect is used against enemies in The Subspace Emissary, Smash Run and Master Fortress, known as careening, or the cannonball effect in Smash 4. When an enemy is defeated, it is sent flying at an angle (depending on the attack that KO'd it) and deals major damage to other enemies it runs into, before disappearing. Characters with armor will take no knockback. In Smash 4 and Ultimate, characters at higher percentages deal slightly more knockback, a factor popularly known as "rage". In Smash 4, rage starts building up at 35% damage and caps at 150%, at which the character deals 15% more knockback than normal. Characters in the background plane of Jungle Hijinxs take more knockback. In Smash 4 and Ultimate, attacks dealing strong enough knockback to KO opponents before they can act afterwards produce a red-and-black lightning effect on contact, known as a Deadly Blow. This effect works depending on the distance required to KO the character rather than the actual strength of the knockback; for example, a forward or back throw towards a walk-off blast line will trigger the effect if the throw effectively KOs, even at low damage percentages where it would be otherwise very weak, while strong attacks launching foes from one side of the stage to the other will not display the effect if they don't KO, even if the knockback is strong enough to do so otherwise. Additionally, DI can still save the victim after the effect is displayed if the attack can just barely KO them. Attacks that freeze do not produce this effect at any percentage, instead simply causing the screen to flash white. Meteor smashes also do not produce the effect until higher percentages. 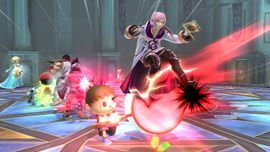 In addition, the game does not consider stage walls, ceilings, or obstacles that can otherwise change the trajectory of knockback (thereby preventing or causing a KO) when determining whether the lightning appears. The Deadly Blow effect also tends to appear slightly after the actual damage percentage at which an attack can start KOing. For example, Jigglypuff's Rest can KO Mario on the 3DS version's Final Destination with no DI starting at 60%, but the effect doesn't appear until 62%. In Ultimate, when a move is expected the potential to end the match (that is, when all remaining opponents are on their last stock and hits the last character not already in lethal knockback or a Star KO), this effect is accompanied by a dramatic slowdown alongside a red background and a unique, much more intense sound effect, with the camera zooming in on the character. This is referred to as Finish Zoom by Masahiro Sakurai and his development team. In Smash 4, launch speed influence can increase launch speed to a maximum of x1.095 by holding up on the control stick, or decrease it to a minimum of x0.92 by holding down. From update 1.0.4 onward, this does not apply if the target is launched at an angle between 65° and 115°, or between 245° and 295°. In Smash 4, buried characters take 30% less knockback from attacks, provided these are strong enough to hit them out of said state. Set knockback, also referred to as fixed knockback, is a property of some attacks where the amount of knockback dealt by the attack is always the same regardless of the opponent's percentage, stale-move negation, or how much damage the attack does. Moves with this property can be thought of as those having a knockback scaling factor of 0, though this is actually not the case. Usually, set knockback is used for the first hits of a natural combo or multi-hit move, while the last hit deals normal knockback (sometimes called "scaling knockback" to contrast), to make it easier for the entire attack to hit regardless of the opponent's damage. While damage is not a factor for set knockback, the character's weight still is, so the term weight-dependent set knockback is sometimes used. As of Smash 4, the effect of launch rates on fixed knockback is drastically reduced, to the point of barely having an effect at all, while Shulk's Smash Monado Art is ignored entirely. However, other knockback modifiers, such as rage, crouch cancelling, or charging bonus, are still calculated normally. With the exception of Captain Falcon, all characters in Super Smash Bros. have at least one move with set knockback. DK's dash attack, Spinning Kong, and Hand Slap. Fox's down aerial, up aerial (first hit), Blaster and Reflector. Kirby's Final Cutter (meteor smash and up slice), up air, forward air (all but the last hit), neutral air, down air (landing hit), and Inhale. Link's up smash (first 2 hits). Luigi's sourspotted Super Jump Punch dash attack, down air, and taunt. Mario's Super Jump Punch (excluding last hit), down air, and Mario Tornado. Ness's PK Fire (all outside of first hit). Samus's up air and Screw Attack. Yoshi's up tilt, down tilt, Egg Lay, Yoshi Bomb (stars). Most neutral attacks have set knockback during the first hits. Mario and Dr. Mario's Mario Tornado, Super Jump Punch, down air (excluding the respective final hits; Dr. Mario's down air's last hit also has set knockback), down angled forward tilt. Fox's Reflector, down aerial, and up aerial (first hit). Luigi's taunt, sourspotted Super Jump Punch, and down angled forward tilt. Kirby's Hammer (in the air) and Final Cutter. Bowser's up throw and down air's looping hits. Peach's Peach Parasol's first hit. Captain Falcon's uncharged smash attack with a Home-Run Bat and neutral air (first hit). Falco's Blaster (both neutral special and shots during throws). Young Link's forward smash (first hit). Mr. Game & Watch's Judge #8. Many jabs, such as Mario's, have set knockback for all but their last hit. Many multi-hitting smash attacks have setup hits with set knockback (e.g., Ness's up and down smashes). Luigi's down taunt and sourspotted Super Jump Punch. Toon Link's forward smash (first hit). Kirby's Final Cutter (up and downwards stroke). Mario's Mario Tornado and Super Jump Punch (excluding their respective final hits). Fox's up aerial (first hit). Wolf's neutral aerial (3rd hit onward) and Reflector. All windboxes, except for Mr. Game & Watch's down tilt, Ike's Tempest, and Greninja's up special and down taunt. Bayonetta's late After Burner Kick (default). Bowser Jr.'s Mechakoopa (first hit). Captain Falcon's neutral aerial (first hit). Fox's up aerial (first hit) and down aerial (excluding final hit). Kirby's Final Cutter (up and down slices). Mario's Mario Tornado and Super Jump Punch (first five hits for both). Pac-Man's down aerial (first three hits). Shulk's Air Slash (first hit), along with the first hits of forward/up smash and up/down aerials. From Melee onward, there are certain attacks that deal zero knockback, causing damage as usual but not flinching, meaning that the hit character can still perform any actions while being attacked. Most attacks with no knockback can rack up damage quickly, as they can hit foes repeatedly without launching them away from their range; other attacks that do cause knockback have hitboxes with no knockback in the middle of them for a similar purpose, an example being Roy's Blazer in Melee. These moves can also be used to "steal" KOs from opponents in free for all battles, as while they do not cause knockback, they will take ownership of the KO on an already fatally struck opponent. Fox's Blaster is the most well known example of an attack with no knockback. Due to the fact that it does not deal knockback, it will not interrupt an opponent's moves or force them out of a punishable state such as being asleep or being stuck in the ending lag of a missed Rest. Idle characters in Brawl will also turn around if they are repeatedly struck with moves that deal no knockback, which is noticeable with Fox's Blaster. In Melee, phantom hits damage foes, but without any knockback. It is also possible for any character to receive no knockback from attacks by certain factors, such as by being giant and metal simultaneously on a low launch rate battle, and as mentioned above, armor will prevent characters from taking knockback while active. Fox's Blaster shots in both his neutral special and throws (except his forward throw). The first hit of Mario Tornado and Dr. Tornado in Melee. The middle hits of Roy's Blazer in Melee. The "crush" of Master Hand and Crazy Hand during their grab attacks in Melee. Charizard's forward air in Brawl (hitboxes furthest away from Charizard). Snake's Hand Grenades (when striking the opponent without exploding). Olimar's antenna during his jab and down tilt in Brawl. Amaranthine gas in The Subspace Emissary. Some consecutive-hitting attacks used by bosses (such as Rayquaza's Thunder). Mario's and Dr. Mario's Capes have similar properties, except that they use the reverse effect. Bowser's Fire Breath (Smash 4 only; hitboxes furthest away from Bowser). Heavenly Light, both as one of Palutena's special moves and as a power in Smash Run. All hits of Mega Man's up air except the first. Some of the food in Mr. Game & Watch's Short-Order Chef will not deal any knockback. Mr. Game & Watch's Judge #1. Bayonetta's Bullet Arts at anywhere except point-blank range. Introduced in version 1.1.0 of SSB4, certain moves are coded to ignore the target's weight when inflicting knockback, instead using a set value of the default 100. As a result, they are much more consistent across the cast when used as set-up hits and similar. A few moves not only treat the opponent's weight as 100, but also temporarily set their gravity to 0.085 and falling speed to 1.5, making their knockback even less character-dependant. However, since the gravity and falling speed alterations are temporary, the knockback is still heavily affected by them, and so the vertical KO power of such moves is heavily skewed towards fast-falling characters surviving much longer than heavy ones. In addition, all throws in Melee treat the opponent's weight as 100. Lastly, some attack effects have weight independent properties, which include the bury, paralyze, and stun effects. However, only the bury effect can ignore knockback resistance. Knockback stacking is the means by which the game applies knockback to a character who has already been sent flying. The new knockback will sometimes replace the old knockback entirely, sometimes have no effect at all, and sometimes a merge will be performed between the two velocities. This has a large effect on combos, as the character being comboed will often have already been struck when another hit lands. In Melee, the method of knockback stacking used varies based on how many frames separate the first and second hit in addition to the relative angle between the two knockback directions. When the two hits are separated by fewer than 10 frames, the second hit's knockback always replaces the first's. This prevents attacks that hit repeatedly from accelerating the character that they hit with each strike, which would be the case were they added. This can also lead to some interesting scenarios that allow strong hits to be canceled into weaker ones, although this is mostly prevalent in team battles and with certain items. If the two hits are separated by 10 or more frames, the knockback is either set to the stronger value or the two are merged. The relative angle between the two hits' launch angles comes into play here: if the angle is large enough (meaning the hits are in opposite directions), then the two hits are merged via vector addition. However, if the relative angle is small (meaning the hits are in the same direction) the stronger hit is used and entirely replaces the weaker one. Since merging occurs when the hits are in opposite directions, merged knockbacks may be in a direction distinct from either of the previous two. For example, if a character is struck up and right by a strong hit and then up and left by an equally strong hit more than ten frames later, the character will be sent straight up (as the horizontal values cancel out and the vertical ones stack). This often leads to there being residual knockback from a previous hit in a combo which must be taken into account when trying to follow up. In addition, hitstun duration is always refreshed by the second hit regardless of the time and angle between them, and the amount of hitstun applied is the amount that would be applied if the opponent had not already been hit. For example, the additional knockback put on the opponent from any merging does not factor in to the equation used to calculate the amount of hitstun that should be put on the opponent. In Brawl, the second hit usually completely replaces the first hit's trajectory and knockback, but if the first hit is much stronger, its direction and knockback are retained with the second hit having no effect on them, giving the impression of no knockback. Unlike in Melee, no merging is ever performed in Brawl. In Smash 4, knockback stacking returns, but behaves rather differently to how it did in Melee. Whether or not knockback stacking occurs depends on if two conditions are met: 1, that the knockback of the second hit is of similar or lower strength to the first, and 2, that the angles of the 2 attacks are similar enough that stacking the knockback of the two moves will not simply result in the overall knockback velocity being reduced. If both conditions are met, then knockback will always stack. In the event that the knockback of the second attack is significantly stronger than the first, it will completely replace the knockback of the first move. Likewise if the angles of the two moves are almost completely opposite of each other (e.g. the first hit launching at 90° straight up, and the second hit at 270° straight down), knockback stacking will not occur, and instead either the second hit's knockback will be ignored, or if it is of similar or greater strength than the first, it will completely replace the knockback of the first hit. As in Melee, the resulting angle will be somewhere between the angles of the two attacks, being closer to the angle of the stronger attack. In the event that the second hit is drastically weaker than the first, the knockback will still technically stack, but the angle change will be practically unnoticeable. The following is a chart demonstrating how much knockback each character sustains in Brawl. While weight is the primary attribute for determining how much knockback a character sustains, there are other attributes that factor in, such as a character's gravity. This results in some characters sustaining more knockback than lighter characters. The knockback value shown is how much knockback a character sustains when hit with Marth's Critical Hit at 0%, arranged from least knockback sustained to most knockback sustained. All games have a knockback cap of 2500 (or 83 1/3 units per frame), fast enough to move from the edge of Battlefield to the center in less than one frame. Smash 4 has a knockback cap for vertical attacks; equal to a vertical launch speed of 10, or a little over 330 units of knockback vertically. Additionally, attacks that surpass a launch speed of 4.7 when crossing the upper blast line will cause Star KOs and Screen KOs to not occur. Because of this vertical knockback cap in Smash 4, if a fighter were to have an incredibly high fall speed and gravity, it would be impossible to KO them off the upper blast line (unless using an item such as a Beetle), no matter how much knockback they were given. This can be accomplished under specific conditions in the unmodified game, via the use of customs and special smash. According to Masahiro Sakurai, the knockback speed up effect seen in Ultimate was planned to be implemented in previous Smash games, but ended up being scrapped because it was easy to lose track of characters' positions, especially in Super Smash Bros. for Nintendo 3DS. A list of all moves with set knockback in SSB outside of items and get up attacks. An online knockback calculator for Smash 4, including a visualizer for launch trajectory and frame data stored for every character. A link showing the minimum percentage needed for Falcon Punch to KO Mario from the center of Final Destination. This page was last edited on April 17, 2019, at 06:52.